The City of Mandurah has become the first WA local government area to install moving floor technology, reducing operational costs and boosting safety. Regional councils across Australia have been showing exceptional leadership in recent times, in spite of the challenges of working in smaller communities that produce less waste. Within these communities there are champions of waste management, willing to investigate, trial and invest in new technologies that will future-proof their resources for decades to come. From NSW’s Albury City Council, which is on track to halve its waste by 2020, to Shoalhaven City Council’s recent investment in a first-of-its-kind mixed waste processing facility, regional councils across the nation are leading by example. At the end of 2018, the coastal City of Mandurah, located an hour away from Perth, made a bold decision to invest $1.25 million in a hydraulically driven floor conveyance system at its Waste Management Centre. As the existing concrete pit was showing signs of deterioration, the council risked closing its tipping shed for a significant period of time by repairing the existing piece of infrastructure. The Waste Management Centre has been around since 1997 and processes commercial and industrial and municipal solid waste. The team spent two years investigating a variety of options before opting for moving floor technology, a system that would not only reduce the city’s reliance on staff-operated front end loaders, but improve safety and lower operational costs. It also allows its waste processing capacity to increase from 55,000 to 75,000 tonnes per annum. Kyle Boardman, Coordinator Waste Management at the City of Mandurah, says the city was aware of moving floor technology being used in Tasmania and Melbourne. Back in 2012, the city had installed a static compactor and compaction trailers, with turnkey specialists Wastech Engineering winning the contract through a competitive tender process. The Wastech team had proved to be a reliable service provider for the city and was successful in a tender for the moving floor technology. 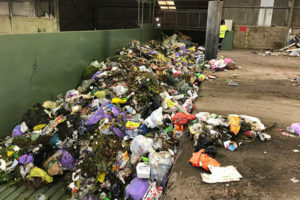 The company knew the ins and outs of the city’s Waste Management Centre, having visited it multiple times over the years to install the compactor and deliver the compaction trailers. “We’d had a number of dealings with Wastech, which helped a great deal,” Kyle explains. Two moving floors were installed onsite in September 2018, servicing both residential and commercial waste. The commercial waste moving floor is located within the existing push pit, with the residential moving floor located on the adjoining tipping floor. 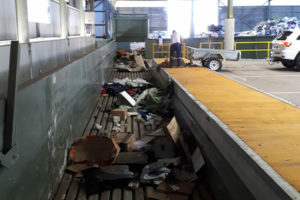 The interconnected moving planks are driven by hydraulic rams which move forward and backwards, allowing the waste to travel smoothly along the floor. It is unique in that when the planks move forward, they move together, but when they retract, they do so in a series of three distinct movements. “This allows the waste to stay in its original position so it remains stationary while the planks move backwards, and then it moves forward together,” Kyle says. Another benefit of the floors is the ability to run them in reverse, allowing material to be shifted to the start of the floor while more is loaded in front of it. The moving floors are safe enough to run while loads continue to be loaded into the pit, another benefit to increasing throughput and speeding up vehicle movements onsite. The waste then flows into a hopper connected to the static compactor, which loads the compaction trailers. “In the past, a front-end loader was required to push the waste into a hopper. Kyle says the front-end loader can now be released to manage other waste stockpiles onsite. He adds that this allows the recovery of scrap metal, e-waste, cardboard and hazardous waste from the municipal waste stream. Kyle says the new design lets the city do that safely. The moving floor technology seamlessly integrates with the existing compaction infrastructure, reducing loading times for compaction trailers and stress on the compaction unit. The technology will also allow the facility to handle additional waste volumes as the city grows. Wastech moving floors are hydraulically powered via a 30-kilowatt power pack and floor speeds can be varied to suit high throughputs during peak loading periods. In addition to a faster and more efficient means of moving waste, the technology has the ability to improve vehicle queuing time. Leak-proof pits can be installed according to council requirements, whether it’s a deep pit for more than 1200 tonnes a day, shallow pit for 20 to 500 tonnes a day, ground pit for low volumes or a combination of all of the above to suit mixed waste streams. 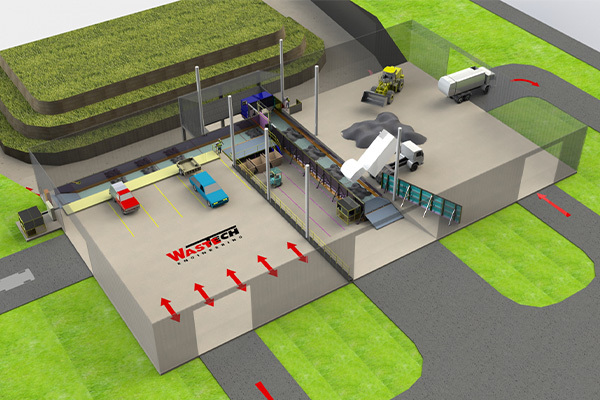 While it’s still early days for the Waste Management Centre, Kyle predicts the moving floor technology will save on maintenance costs and provide a measurable benefit in resource recovery. “Wastech has always been very professional to deal with. They promptly assisted in resolving any issue that arose with the static compaction or compaction trailers,” Kyle says. He says the city’s officers would have no hesitation in turning to Wastech in the future should they require any further upgrades.